YOLO Bike Company was founded on simplicity, innovation and function. We didn’t enter the crowded bike market to offer just another “me too” product. We wanted to provide a line that would take the active YOLO lifestyle to the next level with a durable, timeless, aesthetically soothing and bomb-proof product that would leave some folks scratching their heads. 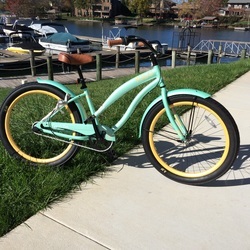 As a matter of fact, many of the specifications on a YOLO beach cruiser are similar to what would be found on a performance level mountain bike, lending lightweight components and durability to the cruiser market. Life is short...Enjoy the ride!. This rig will not only get you to your destination but it will get you there in a New York second! This rascal is built with the same top-shelf quality as the “Classic Cruiser” but equipped with Shimano Nexus 3 speed system to meet the demands of variable terrain and increased speed & performance. The SELeCTA line is offered in Mens & Womens versions with extra wide 3.0” street tires for dampening features, comfort and control. Just one look at the spec sheet and it’s obvious that we’re here to set the standard in the cruiser space. Simplicity at its finest! This ride will not only get you "to and fro" but it will get you there in style. The single speed rear coaster model is well-built to withstand the daily demands of a cruiser (or rental fleet demands). ​Casual but elegant- This YOLO flagship model is offered iN Womens.